We worked at Capel Manor Gardens, Enfield at the weekend. The gardens don't open to the public until March so it was great to be able to have the run of them whilst we were working there. 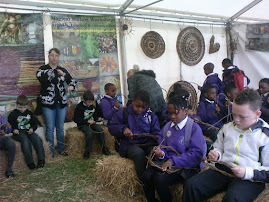 On Saturday we ran a willow weaving course for members of the Worshipful Company of Gardeners and Capel Manor staff. After a slide presentation about willow growing, weaving and planting we made plant supports for the garden. All students managed to create a unique plant support and enjoyed the tour of the garden to see the willow features (huge arch, osier bed, hurdles and unicorns). We were able to work outside for the best part of Saturday at the weather was bright and sunny. Simone and I returned to the garden on Sunday to build a Living Willow Dome in the Education Garden that was created last summer. As a complete contrast the weather was cold and wet on Sunday.